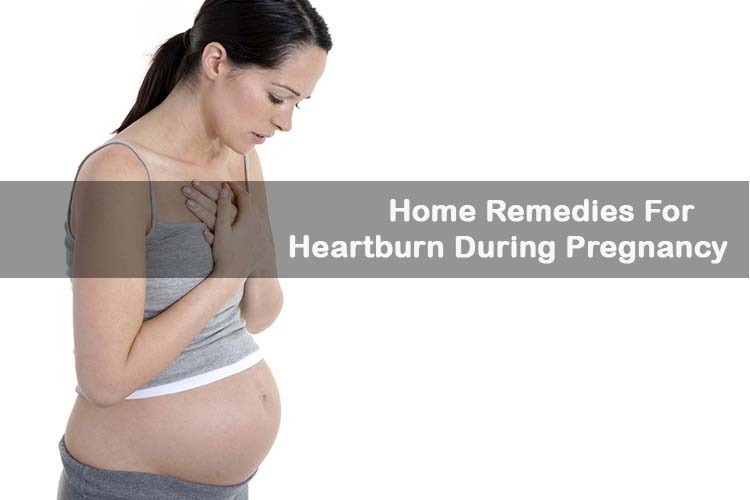 Heartburn is caused by acids pushing up out of your stomach. When you are pregnant, it happens because the stomach muscles relax, making it easier for food to come back up and your growing uterus pushes up against the stomach, which forces acids up. • Sit up straight during meals. This gives your stomach as much room as possible to digest food. • Eat many small meals instead of a few large ones. • Avoid foods with a lot of grease or spices. • Remain sitting up for an hour or two after eating. Lying down after you eat can cause heartburn. • Avoid heavy meals for 2 to 3 hours before bedtime. • Do not drink anything just before or after eating. • When lying down raise your head and shoulders. • Take small sips of water or milk. • Have a few sips of baking soda mixed with water. • Sit up straight or stand. Lying down may make heartburn worse. • At night, sleep with the head of your bed raised a bit, or use extra pillows. • Try sleeping on your side. • Talk to your doctor or pharmacist before you take antacids or any other kind of medication.